Currently, Ivana is based in Long Beach, CA. She keeps a rigorous travel schedule with several guest appearances at tattoo shops and major industry conventions around the world. 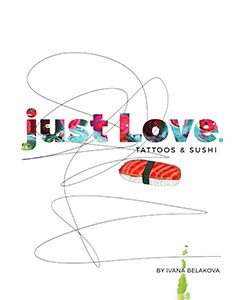 The book, "just Love,Tattoos and Sushi" explores Ivana's most recent work, including the evolution of tattoo in her life and how it has shaped her art and soul. She interlaces photos of her tattoo pieces with stories from clients and her own history. She takes readers on a journey from her early introduction to tattooing on her brother to covering up those early lessons as she has grown into a world renowned tattoo artist. Get a comprehensive look at her world in this 120 page, full-color volume loaded with 100+ photos of her world renowned tattoo work. Get it directly from Ivana signed and dedicated to you and your loved ones.